Hanoi is still a very different city to Ho Chi Minh City (Saigon). I told our guide that I wanted my two favourite Vietnamese dishes, spring rolls & stewed fish, for my dinner. They dropped me off at a lovely café opposite the Sofitel Metropole Hotel. The cafe was created from an old French house with lovely courtyard at the entrance. We sat in the courtyard & enjoyed fresh prawn spring rolls, deep fried vegetable spring rolls & hot pot stewed catfish, with Hanoi beer. The sound of motorbikes hooting let me know I was back to Vietnam again. As it was Friday night we took overnight Victoria train to Sapa. It was the weekend of the 30th anniversary of the victory of North Vietnam in 1975 and a great celebration weekend in Vietnam. The road leading to Hanoi railway station was so packed that our car could not get through, so we got out & carried our luggage through the street. There were lots of local people also travelling to Sapa for the holiday weekend. The railway station was packed with waiting people. It reminded me of Chinese New Year in my childhood days at Cholon, Saigon. 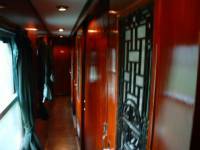 The Victoria train is actually the front three carriages of the long train from Hanoi to Lao Cai. The luxurious Victoria carriages are elegantly decorated in the Orient Express style. There is porter at the carriage to carry your luggage to your compartment. The cool air conditioning was a great relief after the evening heat of the station. The lovely mahogany wooden door with frosted glass opens to two beds with white sheets & two upper folding bunks on top if required. A lovely table lamp on the mahogany foldable table by the window with curtain and a reading lamp above the bed makes for a small but very lovely & comfortable cabin. 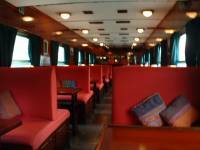 The front carriage is a restaurant car for meals & drinks. The slow train journey made it very easy to fall asleep. We woke at dawn as the train was coming into Lao Cai . The guests travelling in the Victoria train are allowed to stay on board for longer if not up yet , but we went into the restaurant car for free morning coffee. I was surprised that nothing else was offered except coffee for this luxury travel. Our car picked us up outside the station & headed up the mountain for Sapa. The hours drive is a very pleasant journey. On the way we could see the Dzao tribe people in their colourful traditional clothing & hats. The spectacular scenery of mountains & the green valleys below is stunningly beautiful. We arrived at Sapa & checked in at the 4-5* Victoria hotel. Like all the other Victoria hotels in Vietnam & Cambodia it lives up to the usual luxury standards of the group. Many of our clients have stayed at this hotel & the office staff were asking me when our next Dragon Travel guest would arrive. The buffet breakfast at Victoria hotel is quite wonderful. The variety of fresh fruit, breads, cakes & other breakfast dishes was mouth watering. While we were waiting for our room to be ready, due to the early morning arrival, we sat in the restaurant overlooking Sapa town & enjoyed our delicious breakfast. 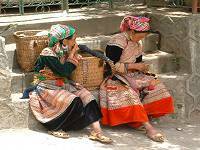 The Saturday market in Sapa is full of local 'Black Dzao' women dressed in their traditional black costume decorated with colourful jewelery & hat. There are several markets, one at the square in front of the church with women selling all items displayed on blankets or mats spread on the ground, and another on the hill with many stores selling all kinds of items from jewlery to clothing to material etc. There is also a food market for vegetables & meat for local shopping. Along the way there are many lovely shops & restaurants. 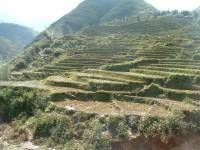 We went to inspect the other two hotels that we use in Sapa, the Bamboo & the Chau Long. There is good news in that the Bamboo hotel has a new wing which is now used for all our clients. The new building is brighter & better than the old wing. The Chau Long hotel is also building a new wing with swimming pool. The new wing will have a stunning view over the countryside & the valley. After lunch we trekked for two hours downhill through lovely terraced paddy fields, bridges, stream & duck farms in the valley with views of mountains beyond. This is a very good way to see the life of the village people. The peace & beauty of the nature is there at your feet to enjoy. There are a few Dzao women on the way holding up clothing or material in case we had not bought enough in the market. In the evening there was a big musical celebration in the market square & we went there to watch after our dinner. It was crowded with people watching the singing & dancing on stage. The happy atmosphere was most enjoyable. The last song & dance was still echoing in my head as the whole troupe sang together loudly, 'Vietnam Ho Chi Minh',' Vietnam Ho Chi Minh' repeatedly. This brought back my childhood memories of Vietnam. 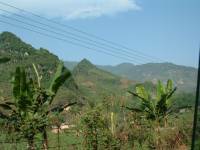 Next morning we drove two to three hours to Bac Ha for the Sunday market. This Sunday market is not to be missed. This is bigger & more colourful than the Sapa Saturday market., with a good choice of things to buy. 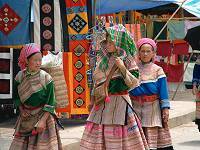 The H'Mong tribeswomen wear different costumes & hats in many bright colours. We spent hours wondering between the market stalls with our camera and I bought three beautiful wall hangings in yellow & red at $10 - $15 US dollars each. I wanted to hang them on my wall at home to remind me of Sapa. After lunch of Hanoi beer , fried noodles & rice we spent a pleasant couple of hours trekking at Ban Pho village. This gentle walk through the village looking down to the beautiful green valley of rice fields & greenery was most enjoyable. On the way we saw a young girl riding on a buffalo, a group of women & men in traditional costumes coming back after a hard day work in the field, young boys running to the door to say hello to us. I felt so happy. 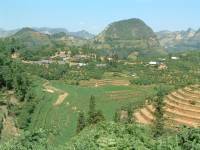 We drove back to Lao Cai to catch our overnight train journey to Hanoi. This time we travelled in a carriage further down the train - behind the Victoria Carriages are the 'Tulico' carriages - also nicely decorated with wood panelling, the Tulico does not have a restaurant car like the Victoria train but the cabin is bigger. Actually, we travelled even further back in the 'Polestar' carriage - more fun & noisier with communal basins for washing. The light is bright & you get a knock at the door in the morning before arriving at Hanoi. Happy lady, just sold me a shirt!